We’ve just published the feature scope description for SAP Cloud Platform and would like to get your feedback. This document describes the legally binding functional scope of SAP Cloud Platform including our service portfolio. SAP Cloud Platform is an open platform as a service to build, integrate, and extend business applications in a fully provisioned environment. 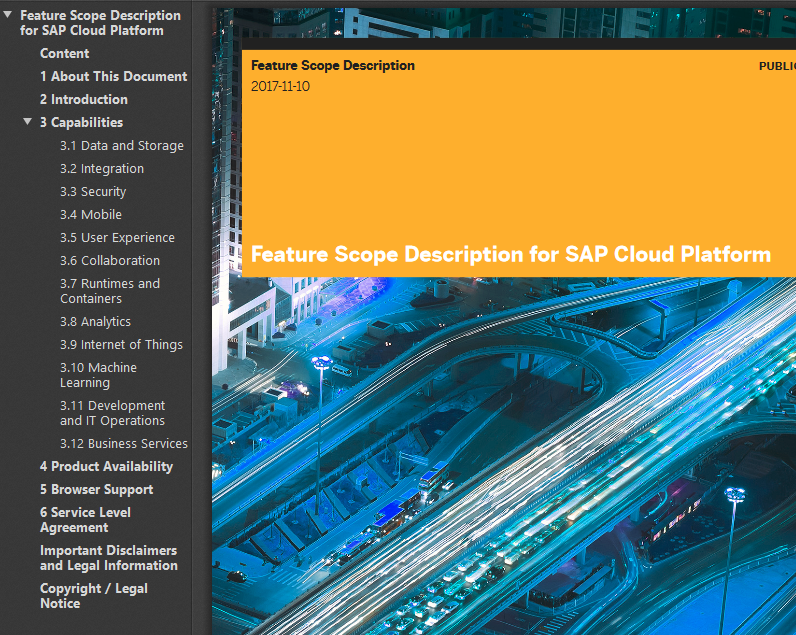 This feature scope description provides a concise, high-level overview of all SAP Cloud Platform capabilities with their associated features, as well as technical constraints and product characteristics such as security certifications, in one single document on only 26 pages. As this document stays on a rather high level, you’ll already find links to more detailed feature scope descriptions for individual features. Just follow the links to the detailed documents and you’ll find more information about SAP Cloud Platform features, no matter if you are already using them or would just like to find out more about them. We’ll make available detailed documents for our service portfolio soon. This is the first edition. So please reach out to us and send us any feedback that helps improving the feature scope description. Previous Hey, SAP HANA, express edition! What’s your SQL port number?